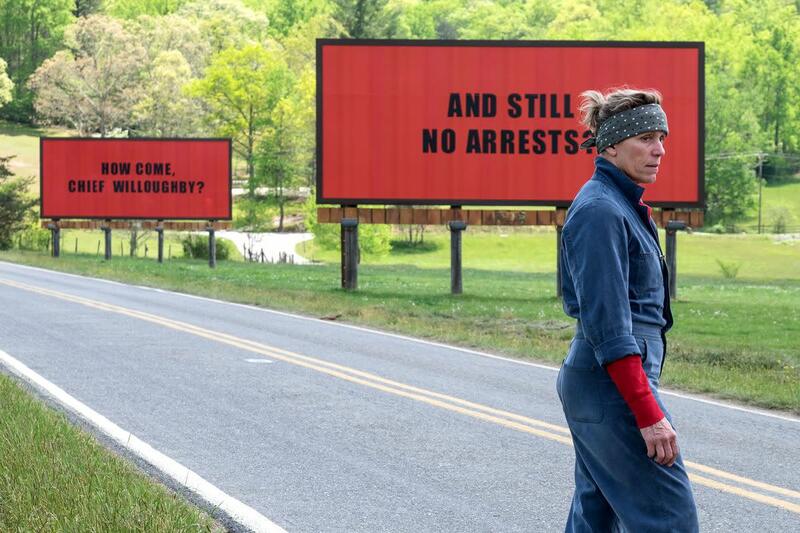 THREE BILLBOARDS OUTSIDE EBBING MISSOURI – REVIEW – Fargo goes to Missouri as Olive Kitteridge is angry with Woody the barman from Cheers. Ebbing Missouri is the kind of small town in which everyone knows everyone else’s business. And a terrible crime has been committed. With the failure of the local police chief to apprehend the guilty, a distraught mother (Frances McDormand) decides to take things into her own hands by advertising the police department’s apparent ineptitude to the world. Martin McDonagh has written and directed a smart and complex dramedy with a crowd-pleasing performance by the actress who could challenge Meryl Streep for the American acting crown. Sam Rockwell and Woody Harrelson also have solid parts, with McDonagh giving everyone lines that are as chewy as tobacco. The only problem if the film has a weird internal inconsistency. It’s supposed to be about how terrible violence can have consequences on the lives of those left behind, but all the violence of the film seems to be strangely weightless and bouncy. It wants to say something serious but also wants to wear a silly hat. There are plot holes and absurdities that clang against the realism of other parts. Also I’m not entirely sure that Martin McDonagh really knows much about small town America. I’m guessing that a lot of Ebbing was inspired by movies rather than a real place. That said it is funny and the acting is great.